(TRR) and (PCM) It has always been said that the show must go on and despite dealing with the devastating loss of singer Chris Cornell, whose band Soundgarden was slated to headline Rock On The Range’s Friday night line-up and extreme weather conditions that forced an emergency evacuation from the stadium and several rain delays, Rock On The Range still came out with a shining year in the end. This year marked the festivals largest attendance record with 135,000 rangers in attendance. We can’t even begin to comprehend the sheer amount of challenges this festival was faced with this year. While the world was reeling from Cornell’s sudden passing, festival organizers were left scrambling a mere day before the start of the festival to figure out just what they were going to do to fill the sombering void in the line-up Friday night. Then let’s talk about the weather! 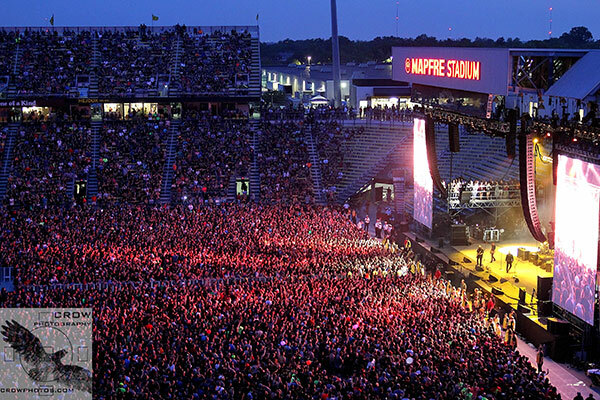 Torrential downpours began Friday afternoon with the threat of a possible tornado that forced an emergency evacuation from the stadium which led to roughly a four hour delay in performances before the crowd was eventually allowed back inside of Mapfre Stadium and the show recommenced. Huge thank you to the city of Columbus, Ohio for allowing the curfew to be extended and majority of the band’s were able to still perform their sets as planned. Bands such as Of Mice and Men, Gojira and Bush were forced to play sets that were a bit shortened and several hours after they were initially slated to play, but we were incredibly thankful that the show was able to restart. Due to Soundgarden’s tragic absence, Live was the last band to play the main stage on Friday evening and perhaps we were even more excited to see them, freshly reunited with vocalist Ed Kowalczyk after an eight year absence, than dare we say it, Metallica, who were to headline the festival on Sunday night. Don’t hate us Rangers! We are just really, really huge fans of Live! The band performed as if no time had passed at all and we were loving every moment of their set! Live’s performance led into a beautifully fitting tribute to the late Chris Cornell. Everyone was wondering just what Rock On The Range organizers had planned and we were not all disappointed. A blackened stage was set up with two guitars and a image of Cornell was pasted across the video screens with a burning candle while the full version of the classic Leonard Cohen song “Hallelujah” performed by Jeff Buckley was played through the speakers. Everyone, ourselves included, were fighting back the tears when the festival then played several video clips of Cornell singing John Lennon’s “Imagine” and his isolated vocal track of the hit Soundgarden song “Black Hole Sun”. At this point the tears were streaming full force, as Stone Sour’s Corey Taylor accompanied by guitarist Christian Martucci came on to the stage to perform acoustic covers of Pink Floyd’s “Wish You Were Here” and Temple Of The Dog’s “Hunger Strike”. It was a beautifully fitting tribute to a truly legendary musician. It was also beautiful to see just how many other band’s performing at this year’s festival including tributes to Cornell sprinkled throughout their sets. Live did an amazing cover of Audioslave’s “I Am The Highway”, while The Pretty Reckless honored him with a gorgeous rendition of “Like A Stone”. Bush threw a few verses of “Black Hole Sun” into their cover of R.E.M.’s “The One I Love” and Stone Sour performed “Outshined” at the Rock On The Range kick-off party Thursday night. We were graced with somewhat more promising weather conditions on day two of Rock On The Range, with only a slight rain delay early in the afternoon. Majority of the daily schedule was able to be kept on track. We thoroughly enjoyed early afternoon sets from Frank Carter & The Rattlesnakes, Alterbridge, Seether and Skillet before gearing up for the evenings headliners of The Offspring and Korn. The Offspring truly impressed us with their set that was filled to the brim with hit after hit and they perfect amped the crowd for Korn closing performance. These days Korn vocalist Jonathan Davis is looking more refreshed and happy than we have seen him in quite sometime. The band performed an energizing set, which sadly was cut short a few songs due to more inclement weather approaching the area, but overall day two was a rousing success. Throughout the weekend we also caught up with some of the festivals incredibly cool sponsors! 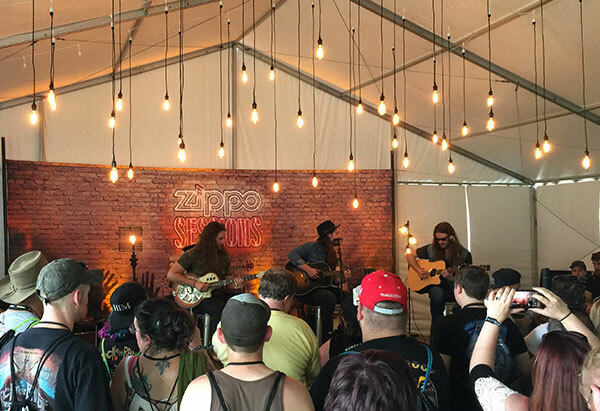 One of our favorites was Zippo Encore who gave fans an incredibly unique opportunity to get up close and personal with a smattering of artists who were performing at this year’s festival with their Zippo Sessions performance space. Talk about an incredible escape from the heat and the crowds of a few minutes! The Zippo Sessions provided fans with intimate acoustic performances from artists such as Goodbye June, Suicide Silence, Skillet, Dorothy and As Lions to name only a few. We were thoroughly impressed with Zippo’s set-up and had an amazing time checking out several of these performances over the course of the weekend. Zippo was also running a really cool promotion during Rock On The Range as well, which included a partnership with Uber to provide fans with rides to the festival in either the Zippo Car or the Zippo Jeep. The riders were treated to some really cool Zippo swag, concert tickets and more! What a fantastic idea considering just how much Uber was utilized during this festival! Seriously, who wants to pay for parking anymore, not to mention drinking and driving should definitely be out of the question! We also had a great time visiting The Music Experience! Seeing the gorgeous hand-painted guitars and all the instruments spotlighted was liking walking through a mini-museum that just happened to sell stuff as well. We have to give major props to the folks at Phillips for enlightening about their Voice Tracer audio recorder. Seriously, our interviews this year have never sounded clearer. This rocking recorder stood the test of getting us through an entire three-day music festival with inclement weather and never skipped a beat! If that wasn’t putting this bad boy to the test that I don’t know what is! 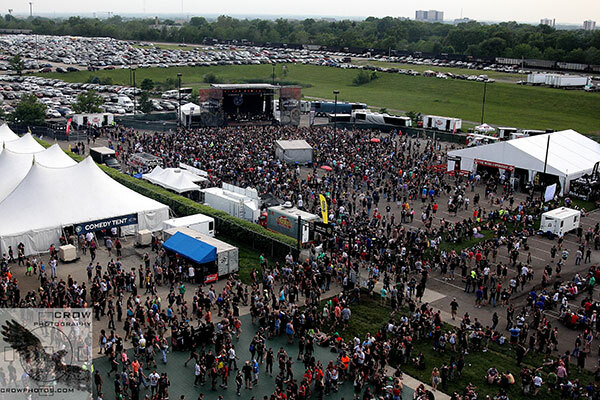 We had our doubts going into day three of Rock On The Range, as the early morning weather forecast was not looking at all promising, however once the clouds cleared out, it actually turned out to be half-way decent day in terms of weather. And of course, everyone was eagerly anticipating the almighty Metallica’s headlining performance that evening. Despite being utterly exhausted from the weekends festivities we were able to drag ourselves over to catch early afternoon sets from As Lions, Radkey and Dorothy and boy were we glad we did! The sheer amount of energy and talent that poured forth from the stage was just the wake-up call we so desperately needed! With energy high we ventured over to see hard and heavy-hitting performances from Suicide Silence, Zakk Sabbath (guitar god Zakk Wylde’s Black Sabbath tribute band) and Viking metallers Amon Amarth. The circle-pits were going strong and we never, ever tire of seeing that huge Viking ship in action. Such a great band! We caught main stage performances from Biffy Clyro, The Pretty Reckless and Primus. Biffy Clyro are such a great band and it was wonderful to see them garner a fairly full house crowd during their set, as they are still trying to make their mark with audiences here in the States. The Pretty Reckless were solid as usual and frontwoman Taylor Momsen gave us one of the most beautiful tributes to Chris Cornell from the weekend. We are not the biggest fans of Primus, but they still got the crowd going pretty well, and we even caught a glimpse of Metallica’s Kirk Hammett side stage enjoying the band’s performance. As we were finally winding down for the two final performances of the weekend, the weather once again began to wreak havoc upon us, as about midway through Volbeat’s set it began to pour down rain and the band was forced to leave the stage for roughly about an hour. We did think that it was awesome that once the rain began to clear up, Volbeat did return to the stage to finish out their last two songs and set the stage for Metallica to close out the festival. We were terribly fearful that due to the severe weather Metallica would not be able to pay, so thankfully everything cleared up and we got one of the most amazing performances in Rock On The Range history. Apparently, according to Metallica’s James Hetfield the festival had been trying to get Metallica locked on the bill for a good number of years, so it was fantastic that the stars were able to align this year and Metallica was finally able to make their debut appearance at Rock On The Range. It is only fitting that arguably the biggest rock band in world should perform at the largest (and best, at least in our opinion) rock festival in the country! Thank goodness for the powers that be! Graciously the city of Columbus once again extended the curfew to allow Metallica to perform their over 2 hour long set and it was absolutely brilliant. The band performed four songs from their recent album “Hardwired … To Self Destruct” and the rest of the set consisted of fan favorites such as “For Whom The Bell Tolls”, “Sad But True”, “One”, “Master Of Puppets” and of course “Enter Sandman” which was the perfect way to close out both their performance and Rock On The Range 2017. We want to thank the organizers of Rock On The Range for yet another epic year and we once again absolutely can’t wait to see what they will have in-store for us in 2018! Rock On! Tagged festival, review, Rock On The Range, rock on the range 2017.